The American Carbide Tool AR-style C6 grade carbide-tipped brazed tool bit has a right-hand cutting direction and a 0-degree side cutting angle for general-purpose straight turning, facing, or boring to a square shoulder on steel and steel alloys. The AR-style tool shape has a 0-degree side cutting angle for square shoulder cuts and a right-hand cutting direction for right-to-left feed. The tool has a positive, 6-degree rake angle that provides a sharp edge for making continuous cuts. The tool has a C6 grade uncoated carbide tip, which provides good resistance to shock and wear for general-purpose machining on steel and steel alloys. Carbide is harder than high-speed or cobalt steel, making it more wear resistant at high speeds and providing longer tool life. The tip is brazed to a square steel shank that fits square toolholders. Brazed tools, often called single-point brazed carbide-tipped tools, are used for metal shaping on lathes or screw machines. These single-point tools have a cutting edge at one end that is a carbide tip brazed to a steel shaft. They come in multiple geometry styles for cutting different shapes and are identified by a lettering standard that conforms to American National Standards Institute (ANSI) B212.1 specifications. The tool has a side cutting edge and end cutting edge, with the tool shape style defining which cutting edge is principal and auxiliary. Brazed tools are available in three hand options: right, left, and neutral. A right-hand tool has its principal cutting edge on the right side of the tool to feed into the workpiece from right to left, a left-hand tool feeds into the workpiece from left to right, and a neutral-hand tool will cut either left to right or right to left. The side cutting and end cutting edge angles, in combination with the angle at which the tool is positioned in relation to the workpiece (also called the lead angle), influence the tool's cutting shape and action. Rake angles are the degree of inclination of the face toward or away from the cutting edge. 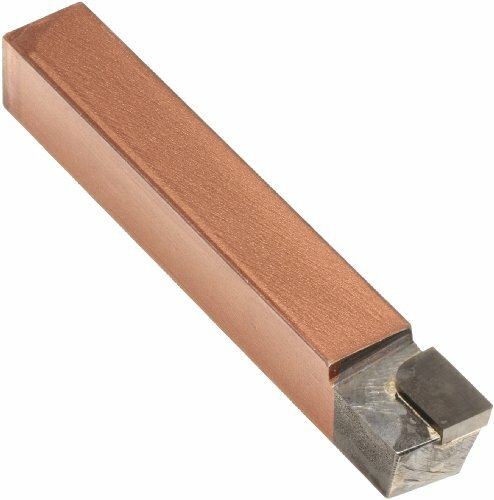 They may be positive for sharp, continuous cuts, negative for heavy, interrupted cuts, or neutral for a true 90-degree cut. The tip, or nose, of the tool performs the finish cut on the workpiece. In general, a larger tip radius will produce a better surface finish and permit a faster feed rate than a smaller tip radius.